wide meadows, we turn aside into the Assabeth. junction with the Concord, has never flowed on earth. "Thoreau read Wordsworth, Muir read Thoreau, Teddy Roosevelt read Muir, and you got national parks. It took a century for this to happen, for artistic values to percolate down to where honoring the relation of people's imagination to the land, or beauty, or to wild things, was issued in legislation." Famous poets and authors have doted on our rivers' beauty and charm. But the rivers coexist quietly with suburban life in Eastern Massachusetts. Between towns you can find surprisingly remote and unspoiled sections, and their quiet grace absorbs the hustle and bustle of modern day life. 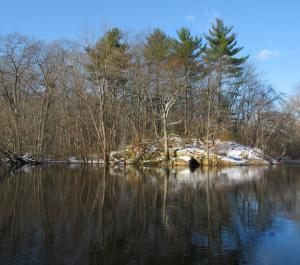 Like much of the landscape in New England, the current path of the Assabet, Sudbury, and Concord Rivers traces back to the receding glaciers of 15,000 years ago. Large glacial lakes now form watersheds in which, today, tens of thousands of people share space with the rivers, forests, and hills. To paddle the Assabet, Sudbury, and Concord Rivers is to immerse oneself in the contrast of a wilderness that flows through the surrounding urban centers. This made the Assabet and Sudbury Valleys one of the country's first vacation spots and a favorite stomping ground of the literary giants of the transcendentalist movement of the 19th century. Just below a bridge by a bustling Route 2 in Concord is the location of Henry David Thoreau's favorite swimming hole. The rivers were a source of recreation and revitalization for all who swam or rowed their waters or fished along their shores. Much of this natural beauty remains today, just hidden around a corner or sheltered behind the trees that line much of the rivers' course. In 1999, sections of the three rivers were designated as Wild and Scenic Rivers by the federal government recognizing their recreation, ecology, scenery, and historic/cultural resources. The Sudbury, Assabet, and Concord Wild and Scenic River is a treasure right on the edge of metropolitan Boston overseen by a River Stewardship Council made up of representatives from local, state, and federal government and three local nonprofit organizations. The Sudbury, Assabet, and Concord (SuAsCo) Watershed: The Assabet and Sudbury Rivers both start in Westborough and flow north into the Concord River at Egg Rock in Concord, Massachusetts, which flows into the Merrimack River in Lowell, Massachusetts, and into the ocean at Plum Island. This watershed is also known as the Concord watershed or Concord basin.